Knowledge formation, even when theoretical, takes time, some boredom, and the freedom that comes from having another occupation, therefore allowing one to escape the journalistic-style pressure of modern publish-and-perish academia… –Nassim Talab. “The future is already here — it’s just not evenly distributed” is a quote often attributed to William Gibson. 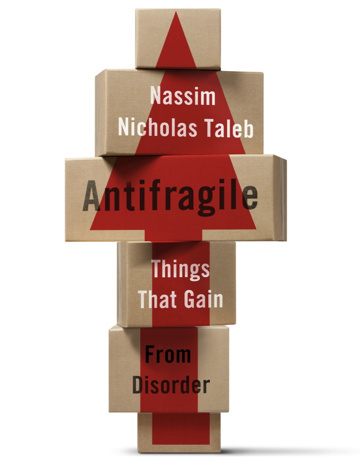 Nassiam Taleb, the author of Black Swan, and more recently Antifragile: Things That Gain from Disorder, asserts that in many cases you cannot predict the future. We have a hard time recognizing good ideas and implementing them. Having time and cultivating a capacity for boredom, as explained below, can contribute to one’s ability to recognize good ideas. When a good idea succeeds, it can have a huge upside–a much greater upside than downside. Taleb says that anything that has more upside than downside from random events is antifragile. Further, antifragility describes “things that benefit from shocks;  thrive and grow when exposed to volatility, randomness, disorder, and stressors and love adventure, risk, and uncertainty.” Inventing can be an antifragile activity. It struck me how lacking in imagination we are: we had been putting out suitcase on top of a cart with wheels, but nobody thought of putting tiny wheels directly under the suitcase…Can you imagine that it took close to six thousand years between the invention of the wheel (by, we assume, the Mesopotamians) and this brilliant implementation (by some luggage maker in a drab industrial suburb)? And billions of hours spent by travelers like myself schlepping luggage through corridors full of rude customs officers. Worse, this took place three decades or so after we put a man on the moon….Indeed, though [the wheeled suitcase was] extremely consequential, we are talking about something trivial: a very simple technology. This tells us something about the way we map the future. We humans lack imagination, to the point of not even knowing what tomorrow’s important things look like. Although not the case with the wheeled suit case, sometimes the difficulty in recognizing good ideas is–as Peter Thiel notes–they often look like bad ideas. We are managed by small (or large) accidental changes, more accidental than we admit. We talk big but hardly have any imagination, except for a few visionaries who seem to recognize the optionality of things. We need some randomness to help us out–with a double dose of antifragility. Even when you do stumble upon a good idea and develop it into an invention, there’s still the difficult road to implementation and commercial success. This is, in part, why there are many many uncommercialized inventions described in patents and patent applications, which you can’t find on the market. …Implementation does not necessarily proceed from invention. It too, requires luck and circumstances. The history of medicine is littered with the strange sequence of discovery of a cure followed, much later, by the implementation—as if the two were completely separate ventures, the second harder, much harder, than the first. Just taking something to market requires struggling against a collection of naysayers, administrators, empty suits, formalists, mountains of details that invite you to drown, and one’s own discouraged mood on occasion. In other words, to identify the option (again, there is this option blindness). This is where all you need is the wisdom to realize what you have on your hands. The difficulty of recognizing good ideas, and the uncertainty of proceeding with an idea, contributes to huge upsides for those that do. Chris Dixon said, “What the smartest people do on the weekends is what everyone else will do during the week in ten years.” Taleb makes a similar point. Many significant inventions were developed by hobbyist and the English clergy. They had ample time to let ideas percolate and collide–in other words, to invent. There were two main sources of technical knowledge and innovation in the nineteenth and early twentieth centuries: the hobbyist and the English rector, both of whom were generally in barbell situations. An extraordinary proportion of work came out of the rector, the English parish priest with no worries, erudition, a large or at least comfortable house, domestic help, a reliable supply of tea and scones with clotted cream, and an abundance of free time. And, of course, optionality. The Reverends Thomas Bayes (as in Bayesian probability) and Thomas Malthus (Malthusian overpopulation) are the most famous. But there are many more surprises, cataloged in Bill Bryson’s Home, in which the author found ten times more vicars and clergymen leaving recorded traces for posterity than scientists, physicists, economists, and even inventors. In addition to the previous two giants, I randomly list contributions by country clergymen: Edmund Cartwright invented the power loom, contributing to the Industrial Revolution; Rev. Jack Russell bred the terrier; Rev. William Buckland was the first authority on dinosaurs; Rev. William Greenwell invented modern archaeology; Rev. Octavius Pickard-Cambridge was the foremost authority on spiders; Rev. George Garrett invented the submarine; Rev. Gilbert White was the most esteemed naturalist of his day; Rev. M. J. Berkeley was the top expert on fungi; Rev. John Michell helped discover Uranus; and many more. The Industrial Revolution, for a refresher, came from “technologists building technology,” or what he [Terence Kealey] calls “hobby science.” Take again the steam engine, the one artifact that more than anything else embodies the Industrial Revolution. As we saw, we had a blueprint of how to build it from Hero of Alexandria. Yet the theory didn’t interest anyone for about two millennia. So practice and rediscovery had to be the cause of the interest in Hero’s blueprint, not the other way around. Having free time and cultivating a capacity for boredom allows ideas to percolate, even subconsciously. This appears to enhance the ability to recognize and implement good ideas and to possibly profit from the antifragile nature of inventing. Antifragle is a thought provoking book in its entirety with possible wide ranging applicability.